NOTE: Due to a number of realities (losing our baking space after the closing of Franny’s Restaurant as well as Patrick getting an exciting new job offer), we have had to reimagine our business. As a result, we have put operations on hold for the time being. We will be back at some stage in the future and will keep our current customers and those interested informed about our next steps. In the meantime, to eat some of Patrick’s creations, feel free to head on over to Frankies 570 in the West Village, Manhattan where he is working as head Chef. Otherwise, follow us on Instagram @brooklynbreadclub for our latest recipe testing, farming, and eating adventures. And, thank you for making us realize this concept (both business and ingredient-model) is something that people want and love. We can’t wait for what the future may bring! Brooklyn Bread Club’s model is run similar to a CSA. In each BkBC subscription package you receive one loaf of bread and one “wild card” item on a regular basis – all picked up or delivered right to you. BkBC subscriptions can occur weekly or every two weeks. “Wild card” items are seasonally baked goods that focus on grains and seasonal fruit or vegetables. For example, our first two subscriptions included fermented polenta shortbread cookies and a rhubarb tart with rhubarb jam and oat streusel as “wild card” items. 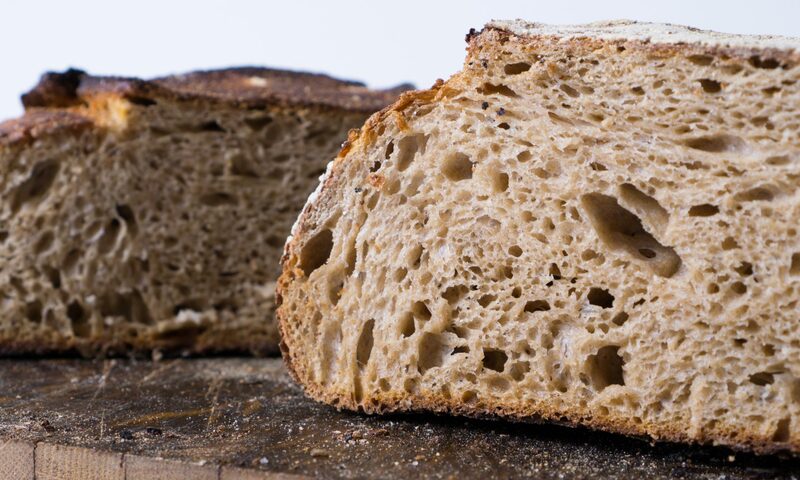 Every BkBC subscription package maintains our concept and core: all breads and baked goods are made with 100% stoneground flour milled from all Northeast grains. Price: BkBC’s subscription packages run at $18 each, including bread, “wild card” item, and delivery. Days and Times: Our deliveries will occur on Thursday evenings, starting on June 8th, and are delivered between 6:00 and 8:30 pm – just in time to have fresh bread for dinner! Email us at brooklynbreadclub@gmail.com to learn more. Our bread and products are prepared in a facility where nuts and other allergens are used. For further questions, feel free to email us at brooklynbreadclub@gmail.com.